Our Boultham Park Digital Archive is now LIVE! Click here to visit it on photo-sharing website, Flickr. Boultham Park is listed in English Heritage’s Register of Historic Parks and Gardens as Grade 2 and therefore ‘of special interest which warrants every effort being made to preserve them’. It is a Critical Natural Asset and has been designated by Lincolnshire Wildlife Trust as a site of nature conservation importance. The lake represents 5% of the total wetlands habitat in Lincoln. Boultham Park was acquired by Richard Ellison 3rd as a wedding present for his illegitimate son Colonel Richard Ellison in 1830. His father Richard Ellison 2nd founded the first bank in Lincoln (more latterly National Westminster Bank). Richard Ellison 3rd was the High Sheriff and an MP for Lincoln between 1796 and 1812. 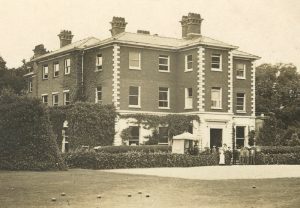 The estate underwent a period of development under Colonel Richard Ellison, who was a Justice of the Peace and Deputy Lieutenant of Lincolnshire. In 1857 a large ornamental lake was excavated. The hall was rebuilt and enlarged during 1874 and was thrown open for garden parties, galas and fetes. It is shown on maps as a 3 storey brick house with 7 chimney stacks. There was a large glasshouse on the south side of the house surrounded by a rockery garden. Some of the decorative features included a neo-gothic sundial, a bird bath (now in St Helens Church), and a large monument to a favourite horse called Simon (now in Simon’s Green). 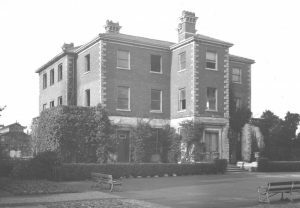 Upon Col Ellison’s death in 1881, Boultham Hall passed to his son Lt Colonel R G Ellison, who died in 1909 after which the hall became vacant. 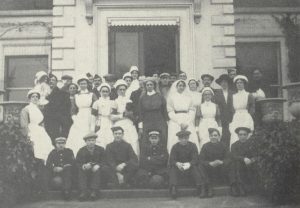 During the First World War, the house served as a convalescence home for soldiers with the Hall Drive Bridge being known as Soldiers Bridge as this was as far as the residents were permitted to walk. During World War Two, areas of the park were planted with sugar beet as part of the Dig for Victory campaign. On the site of the larger original estate the first tanks were developed. To maintain secrecy they were called ‘water carriers for the people of Mesopotamia’. Local people struggled with this name and referred to them as ‘tanks’, and this name remains today. After the war much of the land was sold for new housing. The remaining grounds were finally secured by the City Council in 1929. The grounds were laid out as a public park with the hall being demolished in 1959. The only remaining evidence of the hall until 2017 was the original pediment and steps. Following the park’s restoration, the hall footprint has now been made visible. 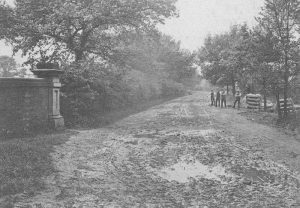 The original walks through the park have been largely retained, all be it with tarmac paving. 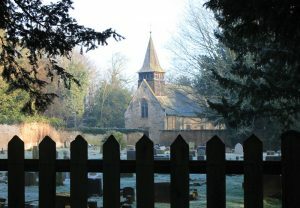 The three remaining substantial buildings from the original estate around the park are St Helen’s Church (grade 2 listed), Home Farm (now a private residence) and the stable block/ coach house. This last-mentioned building was altered during council ownership and has lost its original E shape. Having been vacant since 2001, it was semi-derelict until the Restoration Project plans converted it in 2017 into the Linkage Boultham Park Education Centre, a college campus for young people with learning disabilities. In the graveyard of St Helen’s church is the Ellison family memorial along with a stone that Major RG Ellison brought back from Sevastapol in memory of his men who had died during the Crimean war. There are two cannon balls at the base that have been made into vases and the impact of a cannon ball can be clearly seen on the stone. 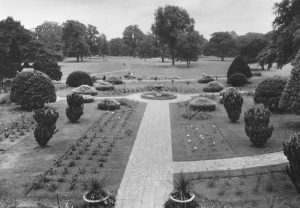 In the period between 1932 and 1967 crazy paving paths were added to the formal fountain garden (most likely 1936). The formal topiary of the yew trees in this area remains today. The bandstand was also added in 1936 being large enough to accommodate 40 performers. Further additions during this period were the ornamental gates at the Western entrance which originated from the home of Joseph Ruston in the Greetwell Road area of Lincoln. Why not now visit our Boultham Park Digital Archive? Find more photos from 1850 to the present day on photo-sharing website, Flickr.